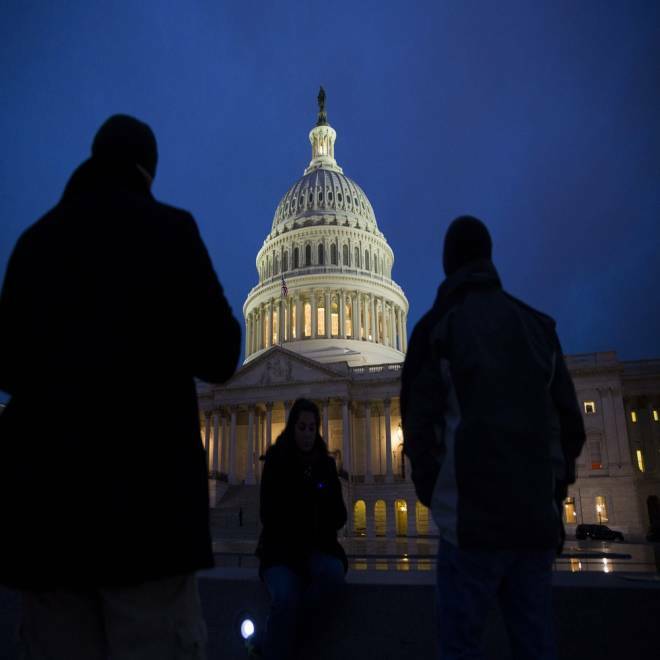 After weeks of uncertainty, bluffing and posturing in Washington D.C., the Senate voted in the early hours of Tuesday morning to avoid the "fiscal cliff" of tax increases and spending cuts. However, the fiscal bargaining is far from over and more budget drama is likely on the way. The Capitol dome illuminates at dusk on Capitol Hill on Dec. 31, 2012 in Washington, DC. The deal brokered by Vice President Joe Biden and Senate Republican Leader Sen. Mitch McConnell of Kentucky would raise income taxes on single earners with annual incomes above $400,000 and married couples with incomes above $450,000. The measure will now be turned over to the House, which needs to give its backing and will hold a session on Tuesday starting at noon. House Speaker John Boehner -- the top Republican in Congress -- said the House would consider the Senate deal. But he left open the possibility of the House amending the Senate bill, which would spark another round of legislating. Although the Senate agreed at the last minute to avert broader tax increases, the very idea of a “deadline” has lost some of its meaning since each budget deal seems to be merely a prelude to another fixed date when some critically important action must be taken – next up: Congress will have to decide what to do about the "sequester" spending cuts which will come up again in February, as well as decide in March on whether to increase the federal borrowing limit. In a frantic rush of negotiations on New Year's Eve, the Senate moved the nation away from the fiscal cliff, voting on a compromise package that increases tax rates on those making above $400,000 a year. NBC's Kelly O'Donnell reports and NBC political director Chuck Todd offers analysis. The indecision over taxes, spending, and borrowing has become chronic, in part a reflection of the fact that neither party controls both the executive and legislative branches. Ever since the Republicans won the House in 2010, the intermittent rounds of bargaining between GOP congressional leaders and Obama have run aground over the fundamentals: the future cost of the entitlement programs -- especially Medicare -- and who should bear the burden of paying for their growth. The two sides’ clashing definitions of “fairness” make it hard for them to decide who should be paying a bigger tax bill. And while tax revenues have been increasing – they’re up 10 percent in the first two months of fiscal year 2013 even under the current tax law -- the increase, even if it is sustained, won’t be enough to pay for future benefits that have been promised. On the spending side, the growth in entitlement spending is largely driven by the demographics of an aging population. The ratio of tax-paying workers to retired beneficiaries was 3.3 workers for every beneficiary during Bill Clinton’s presidency, but it has been steadily sinking and will drop to 2-to-1 by 2030. As 2013 nears, Congress runs out of time to negotiate a deal to avoid going over the so-called fiscal cliff. NBC's Kelly O'Donnell reports. The gap between what members of Congress profess to want to do (reduce future budget deficits and borrowing) and what they are actually willing to do is growing ever wider and more glaring, since spending curbs would fall on people who feel they have earned certain Medicare and Social Security benefits. Failure to reach agreement on these basics is what led to the fiscal cliff that Congress and Obama face. As part of an accord with GOP leaders last year to raise the government’s borrowing limit, Obama signed the Budget Control Act. The law requires about $100 billion in spending reductions in 2013, out of a total of roughly $3.5 trillion in spending. While an approximately 3 percent cut in spending might not seem drastic, the Budget Control Act exempts most entitlement spending from the cuts, so the reductions would be concentrated on military outlays and domestic discretionary spending programs ranging from air traffic control to immigration enforcement. NBC's Chuck Todd explains that a fiscal cliff deal has been difficult to reach because President Obama and Speaker Boehner don't want to appear to be caving to the other. The law would make reductions – unless Congress delays or rescinds them – of about 10 percent in discretionary appropriations for defense programs and about 8 percent in non-defense programs in 2013. If members of Congress seriously want deficit reduction, the Budget Control Act is certainly one way to get it: the Congressional Budget Office estimates that spending would actually go down. Federal spending would be a smaller share of national income in 2022 under the Budget Control Act (22.3 percent of gross domestic product) than they were in FY2012 (22.9 percent). And the budget deficit would fall from 7 percent of GDP in fiscal year 2012 to less than 1 percent of GDP by 2017. Despite the impressive deficit reduction that would be achieved by going over the fiscal cliff, the members of Congress who have sought to avoid the fiscal cliff think the economy is too weak to tolerate the tighter fiscal policy that many of them voted for in 2011. Undoing the tax increases and spending cuts would boost economic growth by about 2¼ percent by the end of 2013, according to the Congressional Budget Office. Does it last only one year or more than one year? Would it significantly reduce future budget deficits? Would it reduce federal debt, measured as a percentage of the nation’s income? Are its spending provisions enforceable and credible – or are they hazy promises that may not be carried out by future Congresses, by Obama, and by the next president? If the primary goal is deficit and debt reduction, is the agreement better or worse than the Budget Control Act? Is it likely to spur economic growth and will it do anything to address the chronic problem of the 23 million unemployed?